In today’s episode of Samuel In Dolgnwot, you can see Samuel writing or drawing in his diary. It might be worthwhile explaining how the Patchwork Art actually works. Basically, I had 12 colour pencils and a pen. 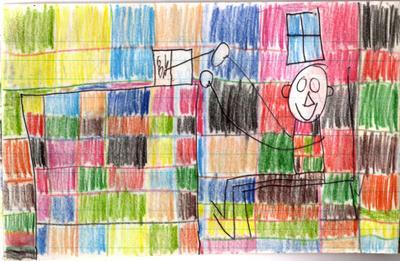 Firstly I drew the objects with a pen, in this case it was the person, the chair, the table & the window. Then I had a “Colour Draw” where the colour the colour pencils were arranged in a random order, then I coloured in the background with the pencils in the order that they were drawn. Firstly I drew a set of vertical lines with the colour pencils and then a set of horizontal lines with the pencils. For this picture it appears that the colour draw was “Yellow, Light Blue, Cream, Dark Blue, Purple, Pink, Black, Red, Dark Green, Brown, Orange, Light Green” Then the resulting grid was filled in with the colours in a clockwise direction, if the line between the current grid square and the next grid square was the same colour as the one I was using then it got to “spread” into the next square. The objects were usually coloured in after this using the same method (The pencils were not reordered however) and in this case it would appear that I decided to make the window light blue. I should probably make an animation of this system to make it a bit clearer. Well, apart from the obvious “It isn’t written by the lunatic monkeys at Microsoft” reasons, there are a few other reasons I really like Firefox. For one thing, it knows when it needs updating, and it makes it a simple “couple of clicks” process. Security problems are generally fixed within a few days of the Mozilla people becoming aware of them, which is much better than the monthly patch-o-rama from Microsoft. Internet Explorer doesn’t seem to know much at all, let alone when it is out of date…and if you don’t run Windows Update, there is a very good chance your copy of IE is out of date….of course if you don’t use IE, then you don’t have too much to worry about. Note that my version of Firefox isn’t out of date, it just keeps the symbol there for a while after it is updated until it checks in with the update server again. Tabs, well, there isn’t much to say there other than the fact that they are great. They make life so much easier. Feed Integration. Firefox makes it nice and easy to subscribe to feeds, and has one supplied with it, BBC World News headlines. Extensions aren’t by any means limited to the statusbar though, Firefox has an extension that brings the Mozilla Suite’s Chatzilla program to Firefox. 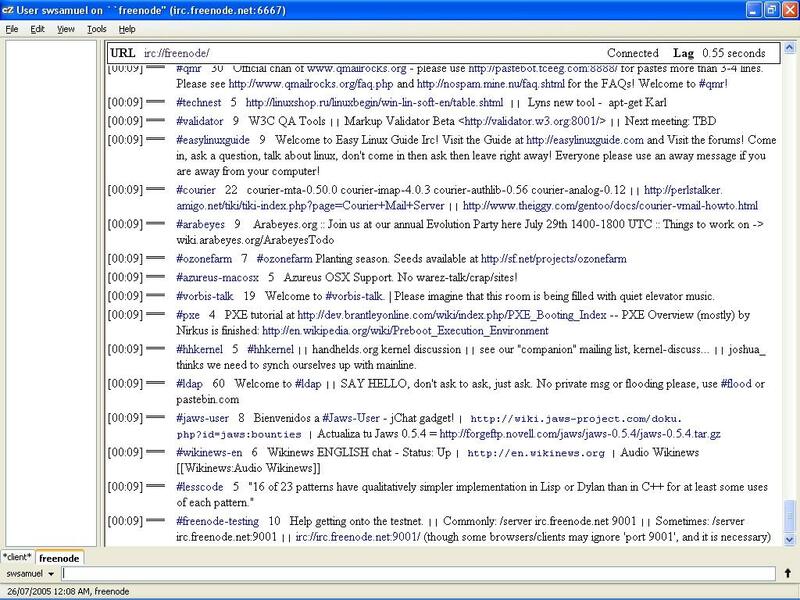 Chatzilla is an incredibly good IRC client. It amazes me how much open source software relies on IRC for developer discussions and end user support. IRC is an open standard, but was something that most people had never heard of a few years back, now it is one of the first stops for open source info. Could somebody remind me to never send “/list” to freenode ever again. 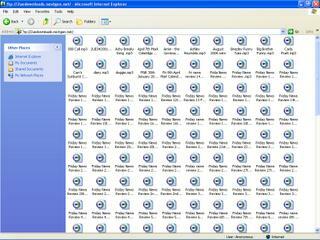 I did it to help create that screenshot, but it ended up taking 5 minutes for it to get the entire list of 2655 channels….never again. Of course, one of the complaints I have heard (and have had myself) is the lack of FTP functionality in Firefox. 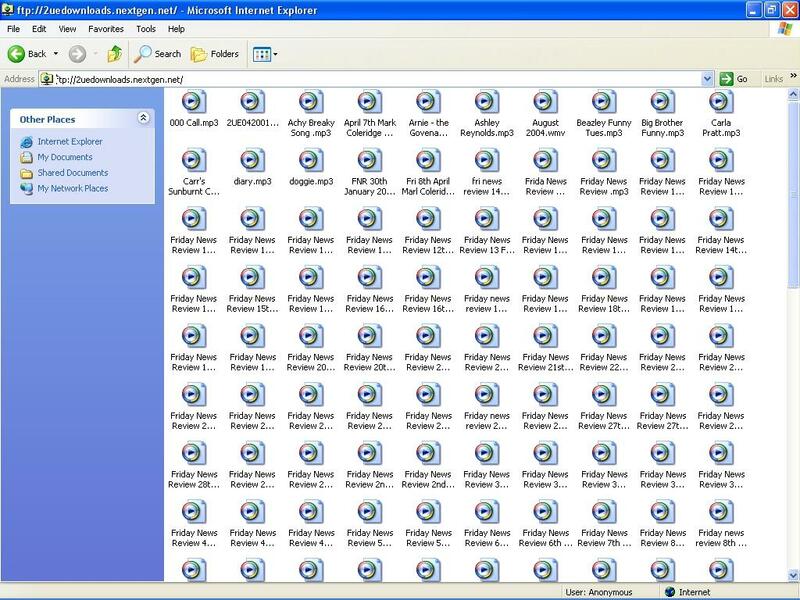 Of all the browsers, Internet Explorer has the most FTP functionality out-of-the-box as it has a Windows Explorer style FTP interface which works almost the same way as Windows Explorer, it lacks advanced features of most FTP clients, but it does a reasonable job (except for the freeze when it has trouble connecting). Firefox has the standard “List the files and folders as hyperlinks” way of showing FTP connections, which is a bit of a standard approach, and is easier to look at when you want to download something, but it has absolutely no upload features, which makes things slightly painful. Firefox also has problems when a standard FTP login goes slightly astray, and trying it through a proxy is like banging your head on the wall in the hope it will turn into a pumpkin…it just isn’t going to happen. Naturally, somebody has come along and written a fantastic FTP Client extension for Firefox called FireFTP. FireFTP has all the features you would expect from a commercial FTP client, Local & Remote folder views, advanced file settings, ASCII & Binary transfer mode selection, and much more. And the best parts are that it is free, open source, and above all, as a Firefox extension, it is cross-platform. So you can take your favourite FTP client everywhere. I did like the statement from somebody at Mozilla the other week along the lines of “We are expecting Firefox downloads to increase after the release of Internet Explorer 7”. Whilst I agree with them, I would like to see that implemented elsewhere, Open Office downloads increasing whenever MS Office is released, Linux downloads increasing when Windows Vista (the new name for Longhorn) is released…you get my drift.